North Bay music fans know the name and voice of Bill Bowker, who has been involved with all aspects of the local music scene since the 1970s and is known best for his Blues with Bowker radio show heard every Sunday night on KRSH 95.9—one of the longest running blues shows in the country. Fans also should know the name Sheila Groves-Tracey, who has spent nearly 30 years as one of the top music booking agents in the North Bay and who has worked with bands and musicians ranging from Neil Young and Melissa Etheridge to Primus and the Red Hot Chili Peppers. Having booked acts for the Mystic in Petaluma and the Uptown Theatre in Napa, Groves-Tracey was most recently the booking agent and co-owner at the popular Twin Oaks Tavern in Penngrove, which she and her partners sold to HopMonk Tavern owner Dean Biersch late last year. Now, Groves-Tracey and Bowker are teaming up to form a new musical management company, Notable Artists Management, with the intention of signing and promoting musicians from the North Bay and beyond. These two know their stuff, and they prove it right off the bat by also announcing that their first signing is rising Americana star David Luning. Given that Bowker and Groves-Tracey have seen a lot of talented musicians in their combined 60 years in the business, this new venture is sure to collect some of the best musicians from around the region and propel them to new heights. —C.S. KOWS-FM had a great run at its little studio in offbeat Occidental, but the gracious owner of that studio-in-a-house said they had to move on from that offbeat West County tiny-town—or moooove on—and the eclectic and entertaining community nonprofit radio station spent months trying to find a suitable location. Wouldn't you know it but the Sebastopol Methodist Church had a classroom it wasn't using—complete with chalkboards and a classroom piano, very old-school—and KOWS (107.5 on your FM dial) made the move late in 2015. They're jamming out the programming from the church, with a volunteer staff of 80-plus, and while KOWS has since been battling with a local neighbor over the city-approved proposal to move its antenna (the neighbor is concerned about EMF radiation), the station is halfway there and ready to ramp the listenership zone by tenfold, from 20,000 to 200,000. As the go-to emergency radio beacon for West County, KOWS has come home. KOWS holds a fundraiser concert featuring Markus James and boogie-woogie queen Wendy DeWitt on March 18 at 7:30pm. www.kows.fm.—T.G. Want to know about the latest and greatest in Sonoma County punk and indie bands? Look no further than Onstage with Jim and Tom, the ongoing rock-and-roll interview and performance podcast that takes place on the stage of the Phoenix Theater in Petaluma. Hosts Jim Agius and Tom Gaffey are the hard-working forces behind the Phoenix. Agius has been booking the Phoenix since 2006, and is a natural showman, as seen in his involvement in the increasingly popular Phoenix Pro Wrestling events. Gaffey is a saintly yet anarchic figure in Petaluma's music scene, having managed the Phoenix through thick and thin for over 30 years. Together they make the perfect pair to interview local bands like instrumental surf-punk group the Illumignarly and stoner rockers JRR Tallcan. In addition to the interviews, Onstage invites the bands to perform a set of their songs. The sessions are filmed and posted online at onstagepodcast.com.—C.S. 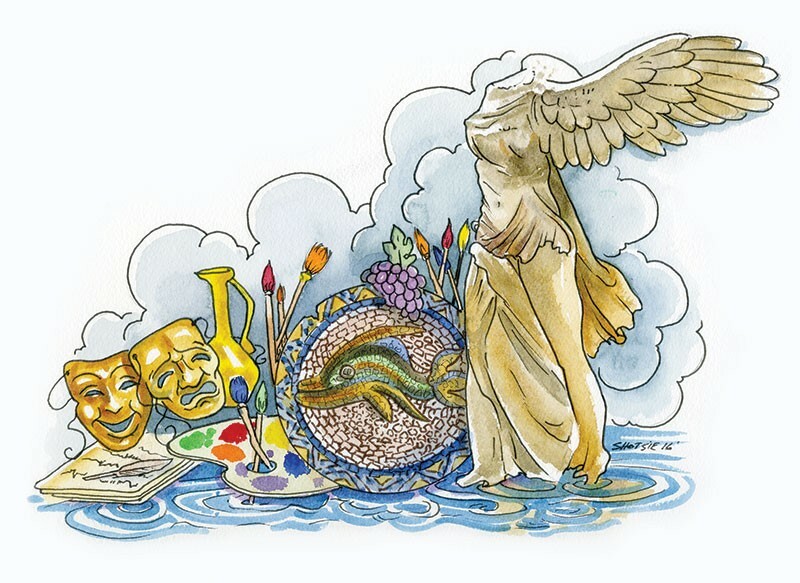 Given that most wine descriptions are as verbose as a Shakespeare play, it's only fitting that old Billy can be found among the grapevines and venues of Napa Valley, in the form of theNapaShakes nonprofit theater group. Matching Napa Valley's world-famous wines with world-class theater performances, and modeled after the Oregon Shakespeare Festival in Ashland, NapaShakes showcases a variety of productions and programs ranging from staged readings, star-studded plays and film screenings streamed from the Shakespeare's Globe theater in London. NapaShakes commemorates the 400-year anniversary of the playwright's death with a host of events in 2016, some of them pretty peculiar. 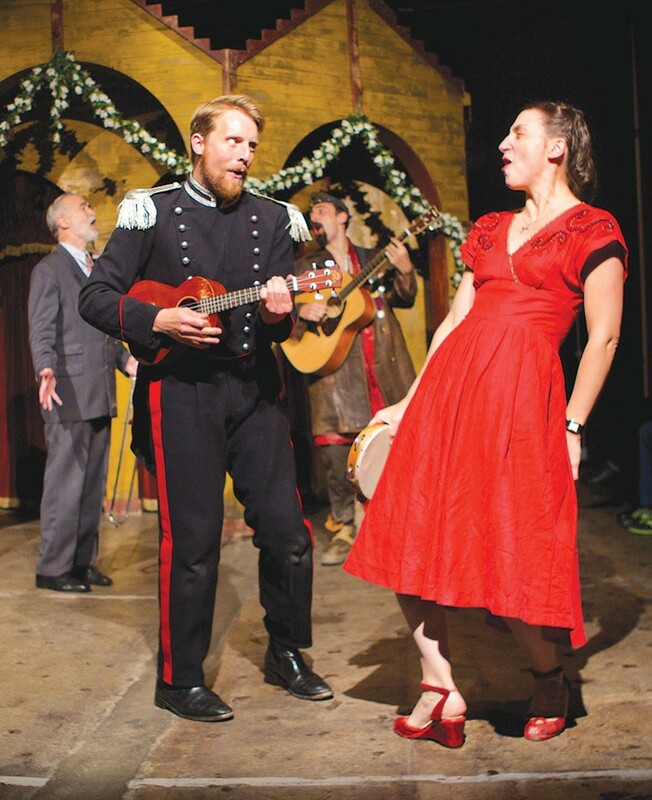 Case in point: at the Napa Valley Opera House, April 22 and 23, the Brown University ensemble Fiasco Theater presents Cymbeline—with a bluegrass vibe! Critics nationwide are hailing it as a marvel. www.napashakes.org.—C.S. These days, dive bars are an ironic destination for city dwellers exhausted by mixology and clever tiled floors. In our parts, however, dive bars are often the only watering hole for miles. Rio Nido Roadhouse, right on the edge of Guerneville's ongoing stylish revival, is such a place. Proud to be divey, serving roadhouse classics like burgers and Buffalo wings, the Roadhouse shifts effortlessly between summer's beach vibe and winter's moody blues. This place has it all, from the feisty bartenders to the crooked billiard table. Come summer, the pool is open, and local bands take to the outdoor stage. The bar is where locals come to gossip and where unassuming, dressed up out-of-towners attempt to have a classy night out. Try the tomato bruschetta and the artichoke dip paired with a way too strong Bee's Knees and soak in the atmosphere of a Sonoma County classic. 14540 Canyon Two Road, Rio Nido. 707.869.0821.—F.T. The late Lux Interior of psychobilly legend the Cramps was famous for performing in a G-string and pouring red wine over himself during the band's heyday in the 1980s. You always wondered—where's that wine from? Our bet is on the Napa Valley. See, back in 1978 the band traveled from its New York home-base to the Napa State Hospital, and performed a show there that is one of the weirdest and most abjectly "politically incorrect" things you will ever witness, short of a Donald Trump junk-grab rally for the short-fingered beatdown set. But the Cramps-at-Napa concert is more than just a raw cultural artifact to give the goo-goo eye to on YouTube—it's stark evidence of how disgracefully milquetoast, fearful and risk-averse our culture has become, especially when it comes to interactions between music and California state institutions. Gone are the days when the likes of Johnny Cash would play Folsom State Prison, let alone the Cramps wailing it out at a mental hospital, with the patients pogoing like it's the greatest day of their lives, which it may well have been. Watch the video and freak out and pour wine all over yourself as you dance along and have a good ol' screaming time of it. "I've got cramps, what are you gonna do about it," shouts one patient, and Lux has an answer for her. The band-audience interactions are hilarious, uplifting and totally wild in their primal intimacy. www.youtube.com/watch?v=Fat2rswNJ1k.—T.G. It's no common thing to find a Burns Supper in the North Bay. The annual event celebrates the life, songs and poetry of Robert Burns, fondly remembered as Scotland's national poet and the author of "Auld Lang Syne." Too bad, because once you decipher the colloquial, 18th-century language, Burns reads like a ribald poetry slam. Healdsburg's Camellia Inn, an 1871 Victorian B&B, hosts a Burns Supper, thanks to proprietor Lucy Lewand's Scottish husband, Archie McAlpine. Sure, they pair the traditional meal of haggis, neeps and tatties with fine Sonoma County wines, but—what was that? 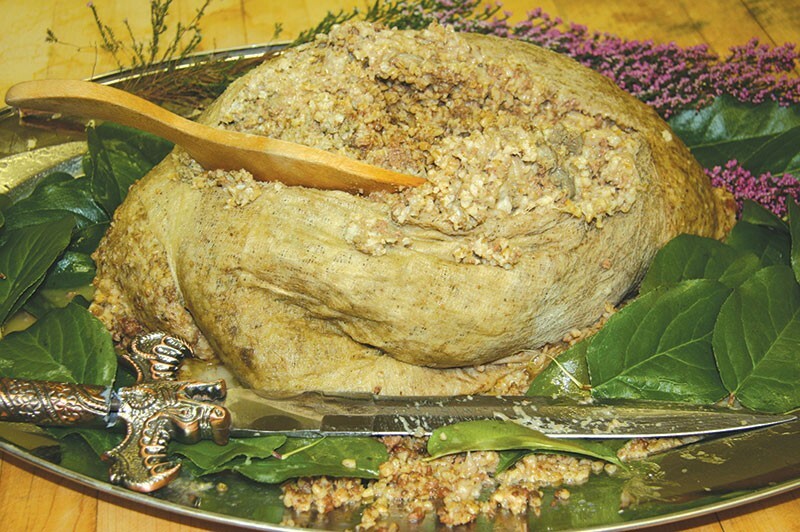 Haggis? Oh, the dread with which even a lapsed vegetarian anticipates the signature moment of the evening: the arrival of the haggis to bagpiping fanfare and a reading of Burns' salute to the dish he called "warm-reekin, rich," and the "great chieftain o' the puddin-race," a mixture of animal organs and roasted oats traditionally baked in sheep stomach. But when it returns from the kitchen with sides of parsnips, asparagus, roast beef and mashed potato, the haggis is as harmless as a couscous pilaf. My real struggle was trying to sing along with the group, in key, to the so-called original melody version of Burns' "Auld Lang Syne." Now that was just offal. 211 North St., Healdsburg.—J.K.